The President Akufo-Addo, has inspected the project site of Rhovanni Royal Company Limited, one of the enterprises operating under Government's “One District One Factory” (1D1F) programme, located at Tanoso in the Ahafo region. He toured the project site on Saturday, 13th April, 2019, on the 2nd day of his 2-day tour of the Ahafo Region. Government is currently facilitating the establishment of 181 enterprise projects in 110 Districts, Municipal and Metropolitan Assemblies across the 16 regions of the country. Out of this number, 79 projects of these projects are at various stages of operation. It is expected that the remaining 102 companies will commence work before the end of the year. In his interaction with the promoters of the project, the President expressed his satisfaction with the progress of work on the site, particularly when local raw materials are going to be used to produce durable products including bricks, pavers, roofing tiles and panels for the construction industry. Akufo-Addo added that the large deposit of clay at Tanoso, where the factory is located, places the enterprise in a competitive position to contribute positively towards the construction of affordable houses for Ghanaians. He applauded the decision taken by Rhovanni Royal Company Limited to install a one-megawatt solar power unit to make the factory completely independent of the national grid. In addition, the Promoters intend to offer the use of their drying ovens at a minimal cost to local potters within the Tanoso community, and also train them in best practices to avoid environmental degradation. It is expected that employment opportunities will be offered to residents of Tanoso and the surrounding communities particularly the youth, with direct employment being offered to 1,800 people, and the creation of some 8,000 indirect jobs. Once completed, the factory is also expected to reduce significantly the importation of clinker into Ghana, which stood at some $700 million. 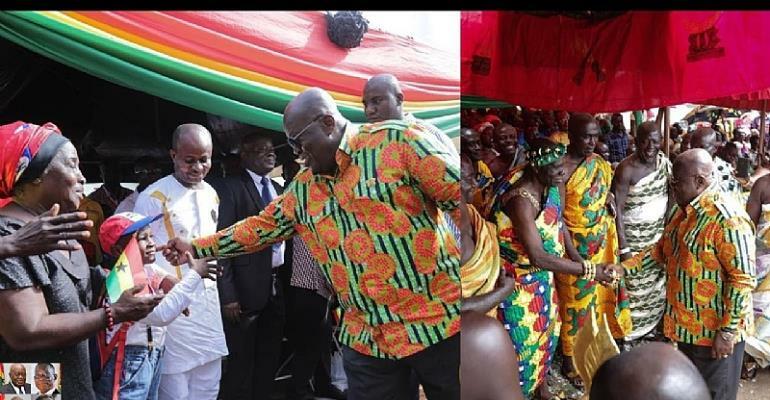 President Akufo-Addo, in the course of the day, also visited Yamfo, Duayaw Nkwanta and Kenyasi, as he brought his 2-day tour of the Ahafo Region to an end. At Bechem, President Akufo-Addo noted that the construction of Bechem Town Roads has been factored into the phase 1 projects of the $2 billion Government of Ghana – Sinohydro deal, with construction set to start soon. The Techimantia to Derma Road, he added, has been included in the phase 2 projects of the Sinohydro deal, and once approval is given by Parliament, the construction of that road will commence.